It’s Lammas (aka Lughnasadh) – a time for celebration! The name Lammas comes from the Anglo-Saxon word hlaf-mass, meaning ‘loaf mass.’ In the olden days, people would celebrate the first harvest by bringing a loaf of bread with them to mass. Did you know that Shakespeare’s Juliet was born on the Eve of Lammas? Apparently this supposedly signified that she would never taste the sweet fruit of love by consummating her relationship with Romeo. I created a Tarot spread in the shape of a man because of the tradition of making a corn dolly on Lammas, as well as shaping the loaf made out of the first harvest into a man or deity (the Celtic Sun god Lugh is a popular choice among neo-pagans). 1. Theme – What is the theme of this year’s harvest? The cards will tell you if it is health (Pentacles), work (Wands), relationships (Cups) or problem solving (Swords). Or perhaps one of the Majors will show up to guide you. Pay extra heed if this is the case – a spiritual lesson is taking you to the next stage of your journey. 2. Chaff – This will tell you needs to be cleared away in time for baking the Lammas loaf. 3. Wheat – As always, you are reaping what you have sown. Remember to give thanks. Whatever your harvest looks like, it brings with it a blessing – even if it is just a lesson. 4. Stewardship – This card tells you how to be a good steward and how to distribute this year’s harvest responsibly so that it brings maximum joy and sustenance to everyone. 5. Giving – Tithing is a practice that is long-forgotten by many, yet it is true that giving is more blessed than receiving. Remember that there are many ways to give even if there is no physical harvest. Perhaps you can give of your time and help someone who is just starting out in your area of expertise? Giving always starts a chain reaction of blessings! 6. 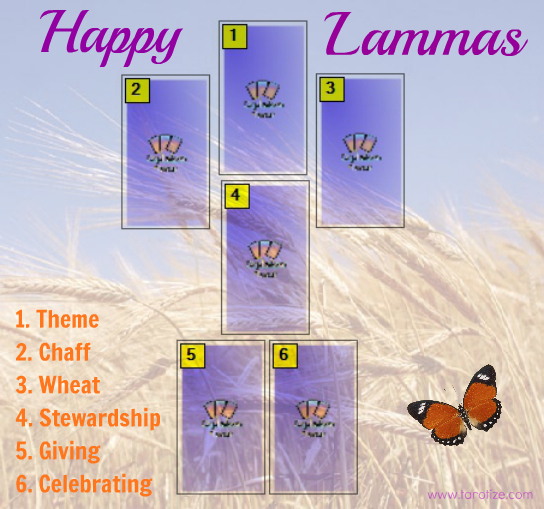 Celebrating – Read this card together with the first card to come up with a theme for your Lammas party. Don’t just focus on traditional card meanings. Allow yourself to be guided by free-associating and looking at visual clues. Tarot Tip: Choose a festive deck to work with for this spread! 1. Theme – The Tower. A Major. So much has happened in such a short amount of time (I’m talking about 2012!) that The Tower seems almost inevitable. A chain reaction of some sort has been set in motion and soon I’ll find both what the catalyst was as well as what remains after the lightning has struck. 2. Chaff – I clearly need a holiday. All this mental activity à la Knight of Swords has led to the beginnings or a proper burn-out. 5. Giving – The Fool. Give others the gift of freedom and fun! Don’t plan what will happen every day of the summer holidays. Go with the flow. 6. Celebrating – Hahahaha! I’m looking at the two dudes at the table celebrating and the thief sneaking off with their swords. Looks like I won’t be able to let my guard down completely.